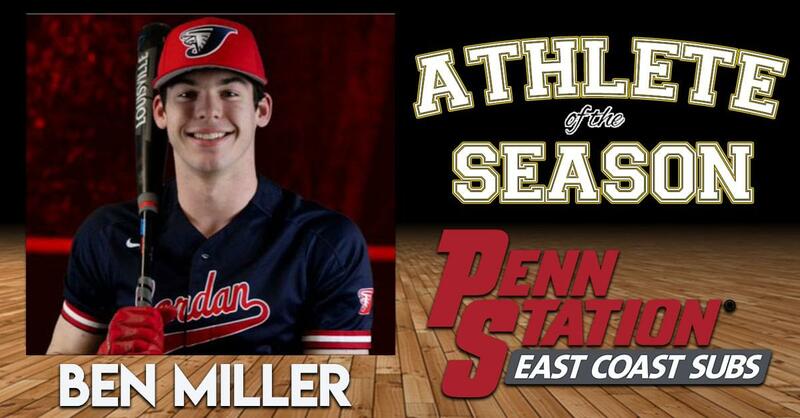 Meet one of our finalists for the 96.1 BBB and Penn Station East Coast Subs Athlete of the Year – Ben Miller! Ben plays football, basketball, and baseball at Jordan High School! When he’s not playing sports he’s apart of the National Honor Society, and the French Honor Society. He plans to attend University of Pennsylvania playing baseball after high school! I have been fortunate to have received several awards but the achievement that means the most to me is having been named Captain of each of my three teams. As a three-sport high school athlete and a captain of all three sports, I have learned a lot about relationships and how to communicate with my fellow teammates. I have successfully led others with diverse back grounds and I have learned how to connect with different kinds of people. When I was younger, I played every sport and participated in every activity possible. As I got older, I stuck to the ones that I loved the most (football, basketball and baseball). The sports that I played in high school were the same ones that I have played since I was a child. Ben Miller represents everything Jordan Athletics aspires to be about. We want our student-athletes to be champions on the field, in the classroom, and in their community as they bridge the gap from adolescence to the early stages of adulthood. Ben is elite in all aspects. He is a truly great Falcon and we will always appreciate his contributions to Jordan High School.